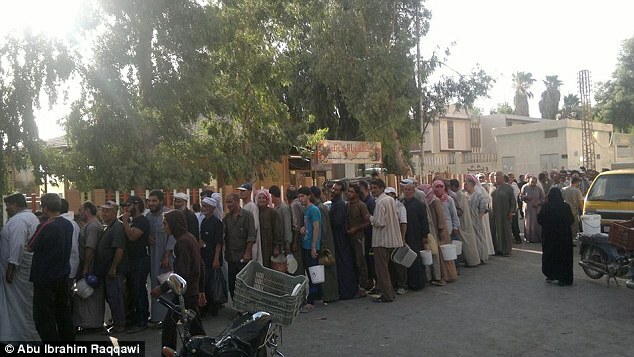 Famished and queuing despondently as far as the eye can see, these images will have the Islamic State’s slick propaganda unit spitting feathers. In scenes more familiar in the most impoverished refugee camps, scores of downtrodden Syrians wait in line for hours for food in the terror group’s self-declared capital Raqqa. It’s a far cry from the all-conquering image of prosperity its jihadi PR machine would like the world to believe. The pictures were posted on Twitter by a member of the anti-ISIS campaign group Raqqa is Being Slaughtered Silently who risk their lives every day by documenting atrocities from inside the city. ISIS looks like a nightmare from the past. Its tactics are brutal, it’s religiously extreme and it is certainly dangerous. By way of their own words, they want to eliminate infidels, impose strict religious law, and establish the “caliphate.” Many feel already psychologically defeated by ISIS; there is a sense that ISIS’s growth in the future is inevitable and that their sophisticated propaganda will succeed in helping them build the foundation of a genuine state and territory it controls. But as Stephen Walt has pointed out in Foreign Affairs ISIS is not the first extremist group to pose a threat. Similar movements have been associated with France, Russia, the Chinese, Cuba, as well as Iranian revolutionaries. They were all ruthless and sought to demonstrate their power and determination to everyone else. The good news is that these historically violent and revolutionary groups were all contained and their threats, while in some cases still viable, have all been diminished. Thomas Lynch III, in a recent report that I highly recommend from the Wilson Center, is quite critical of ISIS and argues that they have underperformed in South Asia and failed their constituents in many ways. They pose no serious threat to Al Qaeda in the global Salafi jihadist project. Lynch compares them to the mythological Icarus by writing that ISIS has flown too close to the sun and engaged in brash and risky strategies that will consume it. Walt explains that outside efforts to destroy revolutionary movements usually backfire because they harden positions and give these movements more possibilities for expansion by enlisting others in the fight against an outsider. A strong US presence with the stated goal of destroying ISIS would likely aggravate the hostility to the West and encourage ISIS’s claim that infidels and outsiders want to encroach upon their land and culture. The US would be better off “leading from behind” which means to stay in the background and provide quiet support. ISIS controls very small amounts of land and has very few military resources to enforce its doctrines. The Soviet Union could impose communism because of its powerful military establishment. ISIS has relatively few troops and no real military power. Moreover, Lynch poses problems for ISIS and their decision to declare an Islamic State. I elaborate a little on these below. All of these are serious weaknesses or mistakes for ISIS any one of which could potentially lead to their downfall. The decision by ISIS to declare an Islamic state has encouraged an international coalition of jihadists to oppose it. The declaration of a Caliphate did not resonate with established groups who differ on how they believe the Caliphate should come into being and when the time is right. ISIS will receive no support from various Islamic groups for its proposed Islamic state. The declaration of the Islamic state is a significant break and a challenge to Al Qaeda’s that only it will make such determinations. ISIS, for example, believes in violence against local opposition groups where the Al Qaeda believes that infidels (that would be Americans and Westerners) must be eliminated as a first priority. ISIS believes in unbridled violence where Al Qaeda is more willing to temper violence – difficult as that is to imagine. Lynch explains that Al Qaeda supports the slow evolution of Islamic Emirates that one day will merge into a caliphate. This strategy is too slow for ISIS who have declared a caliph now (al-Baghdadi). This has again caused a break in Salafist ideology. The establishment of a caliphate is unlikely to generate much emotional intensity. It has caused divides among the various groups and will weaken everyone’s credibility. ISIS’s methods might scare Americans and attract some fanatics but it is not popular with many Muslims. And it must compete successfully with many Middle East identities that are national, sectarian, religious, and tribal. There’s a good chance both Al Qaeda and ISIS will implode. This means containment is the most sensible avenue at the moment. Let the United States remain cool for now and treat the main actors as an annoyance that we must keep our eye on, and our pistols cocked, but we will still bide our time. Posted on October 31, 2015, in Communication and Conflict Resolution and tagged ISIS. Bookmark the permalink. Comments Off on ISIS is Weak and Under Performing.